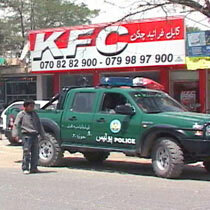 There are now 2 "KFC" restaurants in Kabul, Afghanistan. But in this case, KFC doesn't stand for Kentucky Fried Chicken, it stands for Kabul Fried Chicken. Instead of being a licensed franchisee for Yum! Brands (like KFC restaurants elsewhere throughout the world), this one is owned by an Afghan who has returned to his war-ravaged homeland from the US to bring some American style fast food to his countrymen. K(abul)FC owner Mirwais Abdurrahimzai offers 11 different pizzas, 16 kinds of pizza, burgers and, of course, fried chicken. It even looks a lot like a traditional KFC. There is a typo in one of the paragraphs above. It is stated that "16 diffrent kinds of pizza are served and 11 diffrent types of pizza are served" and in the video it mentions that "16 types of kabobs are served and 11 types of pizza are served"